A couple of years ago I wrote an article about networking in Raleigh that amazingly became a resource for many professionals looking for new events and networking platforms. It also provided a discussion forum and (of all things) a networking platform for readers within the comments. Now that I’m in a new community of people, I thought it was time to do the same type of article for Asheville! Below is a round-up of what I believe to be the best networking opportunities for marketing, advertising, and creative professionals in Asheville. CreativeMornings Asheville, led by Rachel Zink and Mike Marcus, is an inspirational talk series focused on the local and global creative communities, and is hosted at The Center for Craft, Creativity & Design on the last Friday morning of each month! As a chapter of a nationwide program, this monthly event is completely free (breakfast included!) and hosts creative leaders in our community including creative professionals, cultural activists, performers, and individuals that have simply influenced their communities in big ways. Past speakers include Sekou Coleman, Jack Hannibal, Lisa Zahiya, Rev. Jasmine Beach-Ferrara, and more. Don’t miss tomorrow morning! The presenter Cassie Barrett will be speaking on Death Activism. CreativeMornings Asheville is unique from other chapters because typically only cities with populations of more than 500,000 are permitted to participate. Asheville has a population of around 90,000 residents. The leaders of the Asheville chapter were determined to host CreativeMornings in our city, so they tenaciously produced a video application and sent it to the national founders. The organization was able to see the unwavering creativity leading our city, and the rest is history. What an inspiring story! The Center for Craft, Creativity and Design’s artistic basement is the perfect setting to enjoy delicious coffee from Counter Culture Coffee, breakfast from local sponsors, and unparalleled networking opportunities. 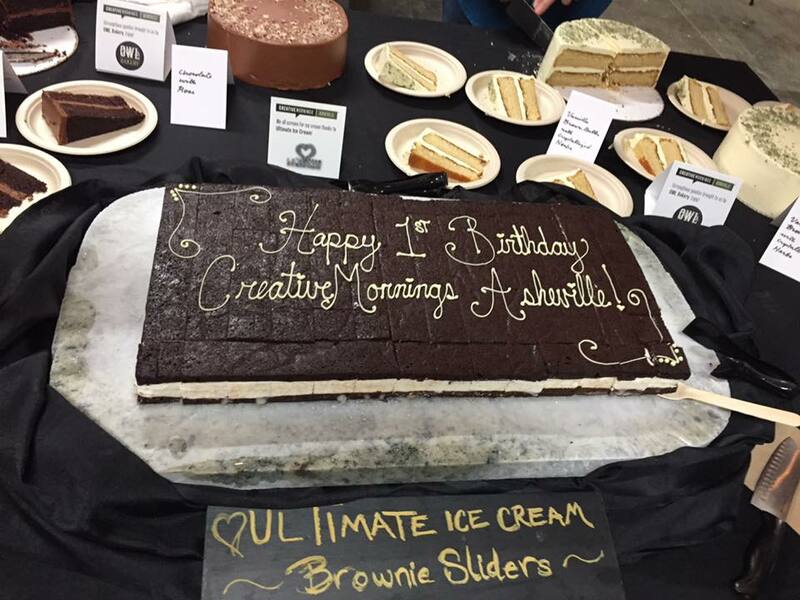 CreativeMornings offers inspiration to your Friday morning and it creates an accessible place to grow new relationships with other creative professionals in Asheville. Hosting various social and education events scheduled throughout the year, AdClub WNC, formerly known as AAF Asheville, is a chapter of the American Advertising Federation (AAF). The purpose of the club is to bring in speakers from outside the community to share fresh perspectives on relevant topics. AdClub also serves to build community, host The American Advertising Awards (the ADDYs), engage students interested in advertising, and give back to Western North Carolina. Below are few of the AdClub programs you should check out! Monthly Socials: These free monthly socials are on the third Thursday of every month and offer a super casual environment to meet other advertising professionals in the community and enjoy a drink. This was a great way to meet well connected professionals quickly. Speaker Events: On the last Thursday of every month, AdClub WNC hosts a paid speaking event that brings in a presenting speaker from outside the community to share fresh perspectives on relevant topics in advertising. This event costs $10 for members and $15 for non- members. Check out my dear friend Lenny from Hey Monkey Design, who is speaking November 30th at the Asheville Screen Printing studio. American Advertising Awards Gala: This is the advertising industry's largest and most representative competition, attracting more than 40,000 entries every year in local American Advertising Federation competitions. The AdClub WNC hosts this event for Western NC creatives to not only compete, but to be recognized and rewarded for their advertising artwork and professional impact. Asheville Design Salon is a monthly networking event series hosted at BaseCampAVL , highlighting the work of graphic designers and collaborators in the area. This is a fun group of creative professionals that talk through the many issues freelancers and creative agencies face, including general business management, organizational resources, generating referral networks, and more. They welcome all who appreciate design and are curious to learn from other artists. This event series primarily targets photographers and videographers, but it is a free event to share creative work and all are welcome. The event is usually hosted once a month on Wednesday evenings in a local video production studio. I have enjoyed the events because the setup encourages spending time with the extremely talented professionals before each program. The incredibly talented and inspirational presenters share why they are passionate about what they do along with their work, which is ALWAYS stunning! What am I missing? Are there any events you think should be on the list? Post any suggestions to our Facebook, Instagram, or LinkedIn page.